I love to have the house smelling like I just took some fresh, gooey cinnamon rolls out of the oven! Scentsy has such a wide variety of scents and I have tried a ton of them. They do not disappoint when it comes to giving your house a scent for the season or your mood. 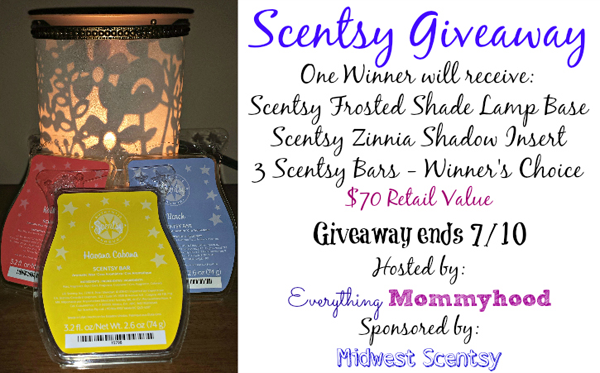 We have teamed up with Everything Mommyhood and a handful of other bloggers to offer our readers this spectacular giveaway from Midwest Scentsy! Enter to win below and good luck everyone! Scentsy has products that will make your home or office smell amazing! They have a variety of scents for you to choose from, so there’s sure to be something you will absolutely love! Check out Everything Mommyhood’s Scentsy Review of the Frosted Shade Lamp & Zinnia Shadow Insert with Scentsy Bars. One lucky winner will receive Frosted Shade Lamp & Zinnia Shadow Insert, as well as 3 scents of the winner’s choice, retail $70. Giveaway is open to US and CAN (Quebec is excluded), ages 18 and up. One entry per household. Void where prohibited. Winner will be chosen randomly via the Giveaway Tools entry form and will be emailed. Winner will have 48 hours to claim prize before a new winner is chosen. Giveaway ends July 10, 2014 at 11:59pm CDT. Disclosure: Everything Mommyhood received the products mentioned above in exchange for our honest review and giveaway. All opinions expressed are 100% mine. Everything Mommyhood did not receive compensation in exchange for this posting.. All thoughts and opinions are those of our own and were not influenced in any way. Facebook, Twitter, Pinterest, Google, and any other social media are not affiliated with this posting or giveaway. This disclosure is done in accordance with the Federal Trade Commission 10 CFR, Part 255 Guides Concerning the use of Endorsements and Testimonials in Advertising. If you have any questions, please email EverythingMommyhood@gmail.com. I like lucky in love! If I win I would not give it away as a gift, I would have to keep it for myself. I would love the Travertine Core Silhouette Scentsy warrmer (with wrap) and the scents i would love to try would be Ocean, Sunkissed citrus and Havana Cabana. I love the Butterfly Warmer Scentsy Wrap. The scent I like is French Lavender. I love the “manly” scents that they offer. I have yet to try Weathered Leather, but it’s on my list now. I like the hand soap and bar in simply apricot. I think this would be for my daughter, she just moved into a new apartment. It would make her new apartment smell nice. I would like to have the Owlet warmer, and try Coconut Lemongrass scent! I would like to win this for myself! I love Scentsy! I would like the Charity Warmer deluxe and patchouli, lavender and Atlas cedar for scents. I have never heard of or seen scentsy before, but I love nice fragrances for the home. I would love the Zebra plug -in because it matches my decor and I would try the Happy Birthday scent bar since it’s MY BIRTHDAY tomorrow! I would love to have their Dryer Disks. I would like to try their Lilacs & Violets bar. I would love to win this for my mom! She’s really into candles, so I know she’ll love the Scentsy even more! I would love to have the coop scentsy warmer wrap. I would like Havana cabana. I would love to try the Sticky Cinnamon Bun and the Vanilla Suede Scentsy Bars. I would love to win this for my home. I love the way Scentsy products make my house smell so good. PS I want to win this for my own home! Not because I’m selfish (well, maybe a little), but because we have lots of visitors right now since we have a new baby in the house & I’d like my home to feel inviting when they walk in. I’d love to have the silhouette warmer and the sunny and share melts. Id love to win this for my new house! We are moving & I think it be beautiful in the new place! This is beautiful! Love Scentsy! ohhhh, I would love the White Crackle Tulip Shade! And I’ve been at a loss to find a new favorite since they discontinued Zeppelin! I’d say my SECOND favorite scents would be Weathered Leather & My Dear Watson. I would love to try the washer whiffs and I would love to have these scents: sweet pea and vanilla and Bora Bora Blossom! I would love to win this because I am constantly using wax melts and candles! I would keep this! I like the shadow insert warmers. I would like to try some of the more masculine scents, like Route 66. I like the Zinnia Scentsy Shadow Insert with any of the Vanilla scents!